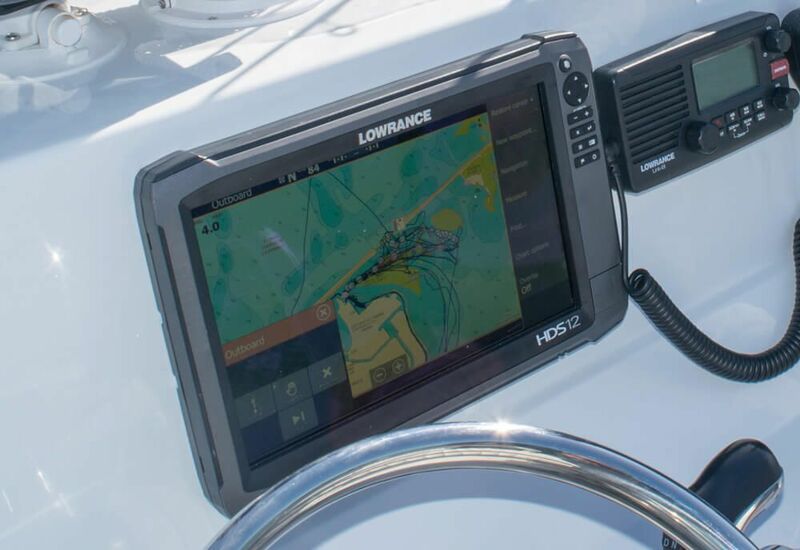 Last week I took a look at the new Lowrance HDS Gen3 unit, in that review, I mentioned that the Gen3 was designed as the hub for your boat, the control unit for everything you do onboard (apart from the fishing, of course). This week, I’m taking a look at another integrated product that works in conjunction with the HDS Gen3 unit. The Lowrance Outboard Pilot with SmartSteer and the MotorGuide Xi5 Electric Trolling Motor. Lowrance Outboard Pilot is an integrated autopilot system that works from any HDS Gen2 or Gen2 Touch that has been updated to HDS 3.5 software and the new HDS Gen3 unit. It works effectively on any boat up to 30ft in length with hydraulic or cable steer single outboard motor systems, making it ideal for the small boat market. 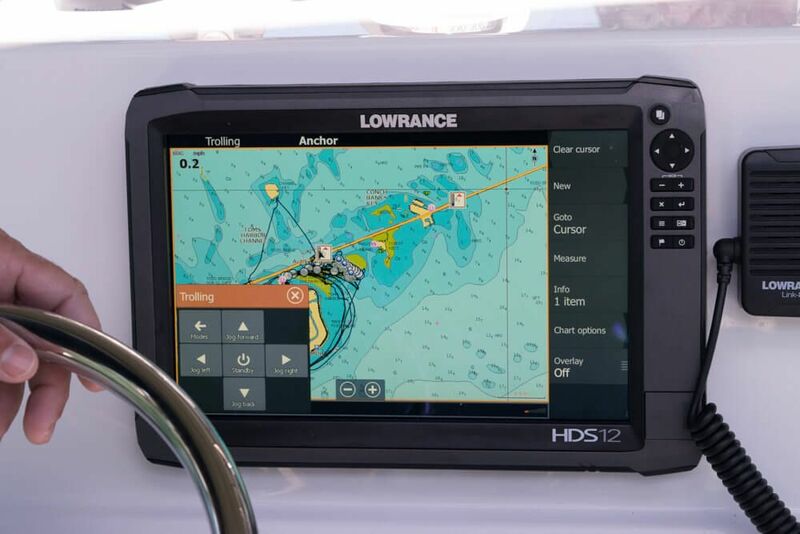 Outboard Pilot takes all of its navigation commands directly from whatever the angler tells the HDS unit to do. The great thing with Outboard Pilot is that it acts as a second pair of hands, allowing you to set your course and then leave the boat to do its work whilst you setup your gear and get ready for the days action. With the newly upgraded user interface accessing the Autopilot is as simple as pressing the power key on the unit and then selecting autopilot. This is the quickest route to start working with autopilot. The disadvantage to this method, that whilst it is quick, it is limiting. You only have access to the control panel for controlling the Autopilot, you don’t have access to any of your other screens such as CHIRP sonar or StructureScan. To get around this you can customise and create your own page, this uses the drag and drop 4 screen ability of the new interface as described in last weeks review. Here you could drag your Autopilot Controller, Plotter, CHIRP Sonar and StructureScan screens into this customised page showing all four on the one screen, for the ultimate control panel! Using the HDS interface you can command Outboard Pilot to steer on a heading, to a waypoint or along a defined route at the speed you want. This can all be done at the touch of a finger on the HDS Screen. Simply pressing your finger on the waypoint you want to go to will tell the Outboard Pilot where to head. Pressing on multiple waypoints will create a defined route that the Outboard Pilot will then follow. This is particularly useful if you want to follow a contour or underwater structure to slowly fish along its edge. For example, if you have a circular structure that you know holds fish all around its edges, you can set Outboard Pilot to slowly motor around the edges of the structure whilst you fish. Using StructureMap you could set your Outboard Pilot to follow a weed line, an edge where mud meets sand, along a ledge or any other feature. Lowrance Outboard Pilot working the outboard motor. Outboard Pilot can also use StructureScan data allowing you to scroll back through your StructureScan history. If you see a sweet structure or a bunch of fish holding on a structure within this data, simply touch the area of the sonar scan, press goto and Outboard Pilot will steer you back to that position. This system also enables you to convert your trails to a route, allowing you to retrace your tracks. So if you’ve been fishing and had success on several marks throughout the day, you can set Outboard Pilot to retrace those steps allowing you to fish those spots again as you head back in, without having to waypoint and mark each one as you fish them. Another useful feature is that you can tell Outboard Pilot to head towards a heading with various different turn patterns. So for example, if you wanted to zigzag toward a heading you simply tell it to start to zigzag to either port or starboard and the degrees and distance of your leg. Once set, the Outboard Pilot will take over, zigzagging its way to the heading. The system comes built in with a number of different turn patterns as standard, it also allows you to set your own custom turn patterns if you want to. The standard set of turn patterns includes turns such as u-turns, spirals, circles, squares etc. Many of these turn patterns are useful for anglers and I think the spiral pattern is particularly useful if you are trying to pinpoint the exact location of a wreck or other, focused structure point. As with any autopilot system, the boat cannot foresee any obstacles in the water or any other things which a normal, squidgy, organic human could. 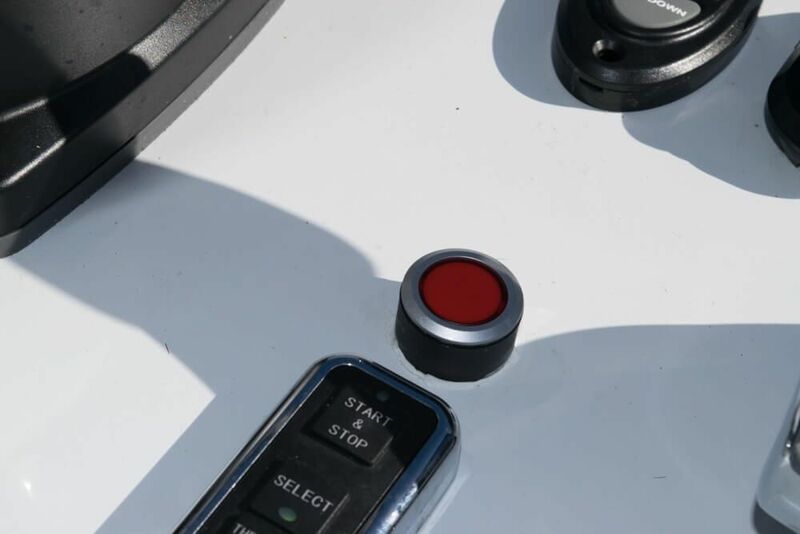 So for safety, if you really need to stop the autopilot quickly, you can fit a dash mountable kill switch that will kill the Outboard Pilot and allow for manual operation again. The kill switch, returns the motor back to manual. For those of you employing both a conventional outboard and an electric trolling motor, the HDS SmartSteer system has full integration with the MotorGuide Xi5. This means you can switch from controlling your outboard to your trolling motor at the press of a button. Whilst the Outboard Pilot will work with any outboard, when it comes to electric trolling motors, only the MotorGuide Xi5 trolling motor will integrate into this system. Lowrance Outboard Pilot working the trolling motor. 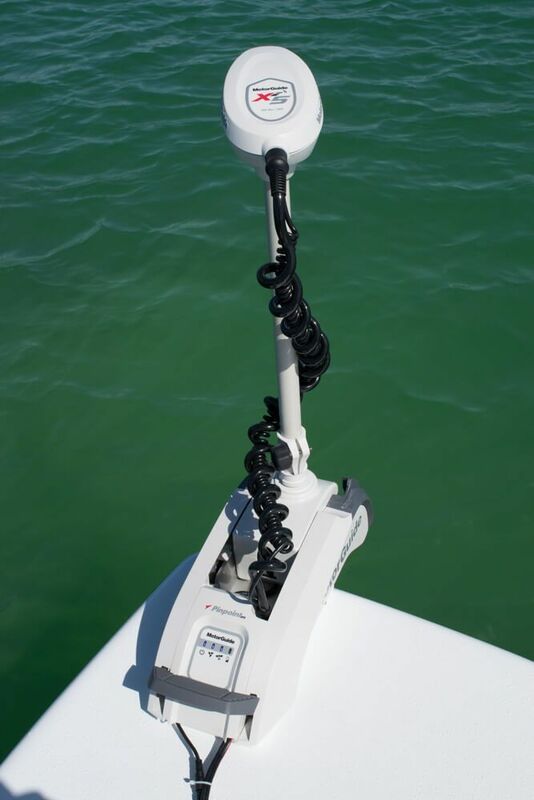 One of the key features I had demonstrated to me in Florida was the combination of the MotorGuide Xi5 Electric Motor and SmartSteer to enable something called “Virtual Anchoring”. This is an awesome system! Using the MotorGuide Xi5 Electric Motor and HDS Gen2 (with HDS3.5 software update) or Gen3 unit you can anchor the boat in a position without the need to physically anchor! In theory this system will work in any depth of water and is more than capable of dealing with strong currents and breezes. 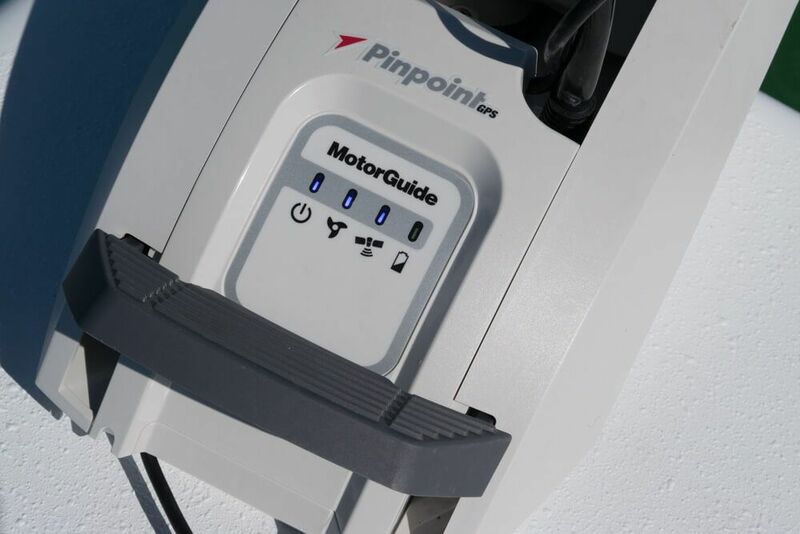 The MotorGuide motor is fitted with PinpointGPS which talks back to your HDS unit and when you tell the system to “Anchor” it will maintain that position until you tell it not to. It does this by continually adjusting its thrust and direction. As I was fishing away on the bow of the boat I could see MotorGuide continually moving and adding in extra power as it maintains a position. PinpointGPS doing its thing keeping the boat in the correct position. The MotorGuide can also be set to creep and anchor, so, you can set it to be anchored in one location and then, slowly, creep to another position and anchor. 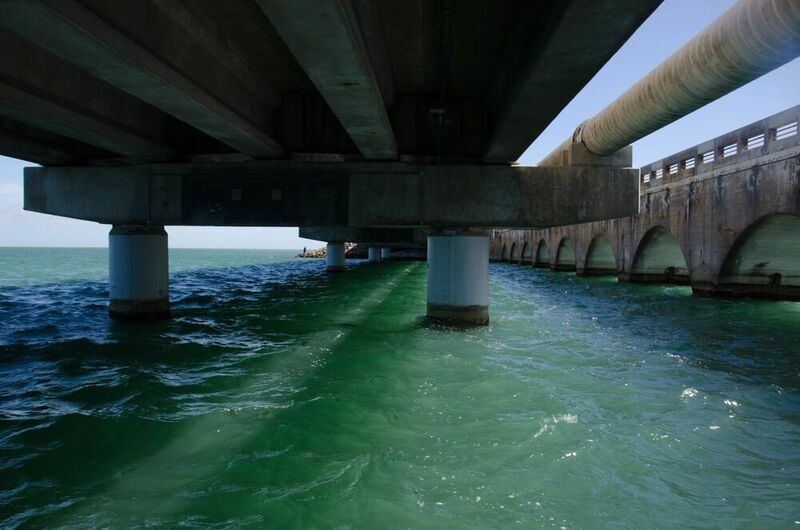 To demonstrate this, Jeremiah Clarke, Lowrance Product manager set the autopilot to back in under the US Highway 1 road bridge and anchor 20 ft from a stanchion supporting Long Key Viaduct, which it did and held for 20 minutes before we moved on. It really is quite incredible. The MotorGuide Xi5 works its way under the road bridge and anchors close to the viaduct stanchions. The MotorGuide can be fitted either to the bow, like on our test boat or on the transom where an auxiliary motor might go. The MotorGuide also features the ability to draw and stow the motor so when it is not in use it can be drawn up and locked in place out of the water. The MotorGuide Xi5 electric trolling motor. As to how battery intensive this is, at present, I don’t know as I’ve seen no data on it. I’d imagine you would need to carry a fair amount of electricity with you to feed these motors, which are available in 12, 24, and 36 volt models ranging from 55 to 105 pounds of thrust. The one downside to the MotorGuide Xi5 at the time of writing (early March 2015) is that it isn’t available in the UK, but when it does arrive, I can see quite a few bass lure guides and competition anglers wanting to at least try this system out with a view to fitting it to their own boats. It makes continually moving and anchoring an absolute doddle! I also did quite a bit of fishing whilst we were using both Outboard Pilot, SmartSteer & MotorGuide. Our first fishing foray was fishing into a fast flowing channel, where the MotorGuide held us in the perfect position to catch a whole host of species. Moving on to other situations the MotorGuide and Outboard Pilot were set to follow man made structures 30 feet parallel to allow us to cast towards shore. The system was also used when Barracuda fishing to follow a set pattern fishing parallel to a winding channel. The boat steered itself along the path of the channel allowing us to cast over and into the channel with accuracy across its full length! Capt. 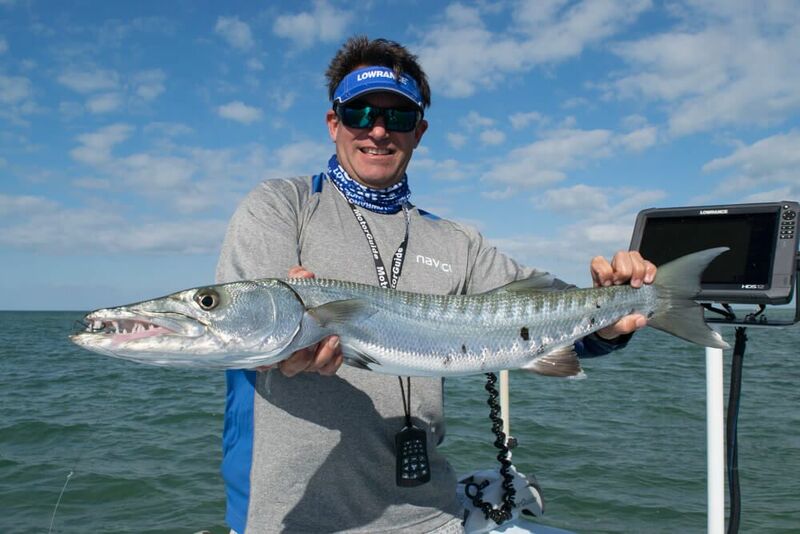 Rich Tudor had his hands free to fish whilst the boat did the work, meaning he could land this ‘cuda! Fitting Outboard Pilot has been made as easy as possible featuring all the parts needed. The system features plug and socket connections which removes the need of complex terminal wiring and the Virtual Rudder Feedback system eliminates the need for a rudder position sensor. In theory, the system is easy to install for an individual with a few hours on their hands. Outboard pilot and SmartSteer is going to allow the small boat angler more time to get their gear ready and also to fish areas in a more precise and consistent manner, particularly when working around features, structures and wrecks. If you are a two man crew and one of you is always steering the boat when trolling for example, Outboard Pilot can take over that role so both of you can fish with absolute concentration. Whilst Virtual Anchoring might not be feasible for most at the moment, its use on small boats for anglers who fish inshore reefs and shallow water for bass and have the boat and room to deploy a MotorGuide Xi5 are going to love this system, as will the small boat competition guys. It takes all the hassle out of anchoring and brings with it a new level of accuracy. Lowrance Outboard Pilot will be released in the UK in Spring 2015 and will cost £1,025 for the hydraulic system and £1,794 for the cable-steer version. Both kits include everything you need to fit the systems including the Autopilot Computer, GPS Heading Sensor and Steering Mechanism. Gen3 units can use this system out of the box but Gen2 and Gen2 Touch systems will require the HDS 3.5 software update, which is free. The MotorGuide Xi5 Electric Motor is not currently available in the UK at the moment. For more information check out the Lowrance GB website.